There's a new free pattern up! Photo credit - © TrudiB, reproduced with kind permission. Thank you! I can't take all the credit for this one - last week or so the Nerdy Knitters group on Ravelry asked for my help with a version of Scotty's Hat from the new Star Trek film. Whilst we were talking about it's construction (the one in the film appears to be made with alternate panels of garter stitch and sideways garter stitch) I started working on some numbers for an alternative version, a 'cheats' version if you like, a Hat that is inspired by the original, with the same style but constructed differently. This isn't a true Scotty's Hat, this is my take on it - one for those who don't like seaming or short rows. Should you be looking for a more accurate version of the construction, try Nicole Lorenz's pattern, which uses short rows and the sideways panels just like we think the one in the film does. This Hat is knit entirely in the round, using garter stitch and 1x1 rib for structure. 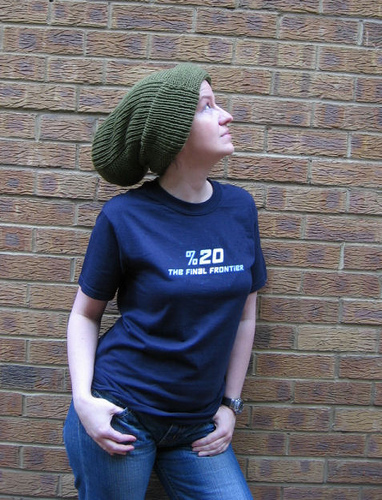 It's yarn thirsty, not leaving much to play with from 200g, yet it is a super slouchy Hat and absolutely perfect for big hair or tucking up your dreads, as demonstrated by the lovely model (and test knitter!) above. Many thanks to the Nerdy Knitters (especially TrudiB) for their faith and encouragement, and for giving me somthing fun to do, which was just the tonic I needed. Now go download and make a great new Hat! Newer:On his feet!Older:Time-out & dealing with the devil.